InPower’s 250-watt LED transformer is available in 12-volt or 24-volt models, both designed to power up to 250W of LED lighting with no minimum load. This transformer can be used to drive either single-colour LEDs or colour-changing (RGB/RGBW) LEDs. The transformer is intended for interior applications (non waterproof), but it can also power waterproof LED tapes without any problems – just as long as the transformer itself is installed in a location free from moisture. The unit is fully sealed with hardwired connections, so it is safe to touch, and with 2 x pre-drilled fixing points it can be installed in most locations. Very little heat is given off by the transformer, so it can be used in confined spaces. Input voltage 220-240v AC. Output voltage 12v or 24v (2 models – be sure to choose the voltage you need!). This item is RoHS compliant and conforms to all UK safety standards. This slimline transformer for LEDs will power a maximum of up to 60 watts of LED tape with no minimum load. Designed for internal use (non-waterproof), it takes an input voltage of 220-240V and is available in two versions, outputting either 12 volts or 24 volts. An internal transformer, available in both 12V and 24V versions, this unit can power up to 100 watts of LED tape with no minimum load. A slimline design, the transformer gives off little heat and is fully enclosed so it can be used in a variety of applications and locations. Our transformer enclosure is a ventilated plastic housing for LED power supplies. It’s an ideal solution for protecting our 150W, 200W and 320W open-terminal Meanwell units. Enclosure dimensions: 284mm x 128mm x 94mm. Made by Meanwell, who are renowned for high quality power-supplies, this internal LED transformer can drive up to 150 watts of any of our strip lights and other LED products. 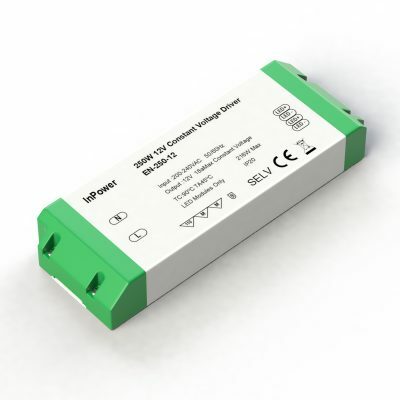 Choose either a 12V transformer or 24V transformer (either can be used with no minimum load).